XL Sportswear - The NEW line from Winkelman's is here! Let your Detroit Football pride show! Winkelman's is proud to introduce XL Sportswear. Available now is the Football shirt. Show your support for Football in the Detroit Area. Coming soon are the Baseball, Hockey, and Basketball shirts. Click on the image below or here for ordering information. 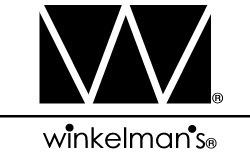 The past relationship and long tradition with Metro-Detroit and Michigan is something we at Winkelman's are proud of. Preparations are underway to bring back that tradition in an online format with new product lines. Copyright @ 2000-2004 Winkelman's LLC. All rights reserved.